At our onsite tastings at The Wine Company, a repeated question pops up: “What is THAT?” they ask referring to the preservation system. We use this to keep wine samples fresh for weeks on end. It is a wine preservation system made by Le Verre de Vin. In our particular case, it is the Twin Pod Bar comprised of two cooling “pods” and a Tower Unit -a sophisticated device that draws out harmful oxygen with sensitive accuracy from still wines and for sparkling wines pressurizes the head space with carbon dioxide to ensure the inherent sparkle remains in the wine. 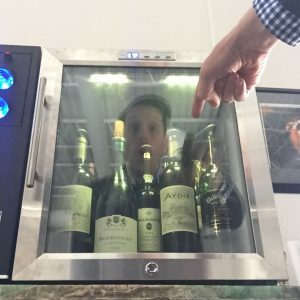 One refrigerator is kept around 50° F for whites and the other at 62° F for the reds but one could set them however they please as we often drop them lower when in use for sparkling wines exclusively. We use our Le Verre de Vin for the wine trade whenever we host a Wine Co | Open House and also keep a running assortment of samples on the go at any given time to taste and revisit and offer a wider audience the same sample over time. It is loads of fun but not merely a hedonistic choice. Le Verre de Vin is but the latest step in minding wine preservation from the vineyard all the way to you. Wine preservation is paramount. Since 1985 we at The Wine Company have sourced the finest wines at the finest value and worked immensely hard to import and distribute these directly to you as the winemaker intended. Because we owe it to the vintner who spends each day striving to bottle the best of each year, we mind every step at every turn. Work in the wine trade and care to explore further?